Drokk! Ep. 1: "I Hear You, Citizen!" - Wait, What? I think I’m going to really enjoy this series, if this first episode is any indication. As much as I love the Fantastic Four and enjoyed Baxter Building for its analysis of storylines and different creators’ artistic peaks and valleys (while pressing my nostalgia buttons), I’m much more intrigued so far by this deep dive into a property and a publishing scene I know very little about. I agree that a little more plot synopsis would be helpful, for the bigger mega-epics, at least. My one carp is that I had to eventually pause the episode and Google what a “prog” is (even though it’s fairly clear from the context). I’d love to know the why and how behind the usage of that term. Volume 2 is probably an easier introduction for new readers more used to a longer-running storyline. In particular the Judge Cal story pretty much covers everything a new reader would need to know. Volume 1 has a lot of good stuff but it’s definitely shakier material than that follows. Great podcast, chaps. First, this was really good stuff. And of course, this is coming out of a scene dominated by war comics in which encountering people with funny accents and then shooting them was the routine. It’s very much something appealed (I hope not appeals) to children. I remember reading a old book on political socialization in western Europe (some time after this, but the book was, if I’m remembering correctly, from the early ‘80s, so the research would have been done about this time or not long afterwards). One thing it indicated was that children acquired their sense of which foreign nations were good and bad much earlier than they could relate that to the history. I specifically remember that British children knew that Germans were supposed to be bad and Americans were supposed to be good before they knew anything about the Second World War (let alone the First) – they acquired the attitudes first and the historical knowledge to inform them later. At this point, one has to note that John Wagner lived in the US until he was 12, and after that grew up in Scotland. (Plus he has a German name. There is no way that he wasn’t teased about that when he was a child.). This is liable to make someone highly conscious of national identity as an issue, I think. It also makes Wagner very different from Pat Mills. Wagner has talked about how he feels that moving from the US to Scotland placed him in a more disciplined environment, and that this was a good thing that more-or-less saved him. It’s quite difficult to imagine Mills ever describing discipline as a good thing like that, especially in the context of school-aged children. I find it very hard to resist seeing a lot of Wagner’s background in Dredd, a fantasy about an undisciplined sprawling American urban world which is kept in working order solely by being under uncompromising control by a figure who more-or-less embodies discipline on any level. Especially in that iconic description when he comes back to Mega-City One: “..,the most violent, evil city on earth. But God help me, I love it.” (the first really memorable line in Dredd, I think). Our hosts were very good on how the citizens of Mega-City One are basically idiots with no impulse control. Which is to say that they’re *children*. Dredd is the grown-up disciplinarian who is in control of a much larger number of children, which is a situation that maps primarily onto the classroom in normal real life (and is therefore perfectly suited for a child to latch onto – Dredd’s world feels psychologically real to a 12-year old). 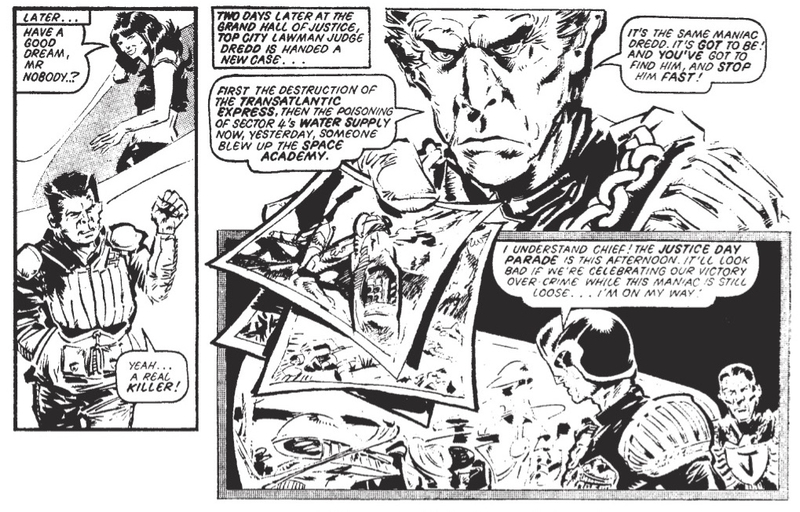 That, via Wagner’s earlier One-Eyed Jack, Dredd’s ancestor is Dirty Harry, is well-known. But note that One-Eyed Jack is itself in its title a Western riff. And the Western influence is there well before Luna-City One: Dredd is routinely referred to as a “lawman” and stories often turn on shootouts determined by who can shoot first. Mega-City One is simultaneously a violent urban hellscape and a sort of untamed Western frontier in need of (you guessed it) law, pretty much exactly as in a Western. And all the very concretely depicted others that are beyond the boundaries of “normal civilized” society: the mutants, the Troggies, etc., — I’m afraid that these are fairly clearly stand-ins for the way that Native Americans are depicted in Westerns. And I really think that all this has to be to some extent about the way in which Britain went from being the most important country in the world to being part of a world in which America was the most important country in the world, that love/hate relationship between the former imperial power and its replacement, the ally whose language it shares and whose culture can therefore so easily penetrate its own. About the consequences of that for British national identity — or more exactly, about how that affects the way that Britain relates to images of America in British pop culture. But I think Wagner was the perfect writer for all this, because it’s also about leaving one country when you’re old enough to grasp what that means, but not so old that it makes you forever an expatriate — leaving it because your Scottish mother split up from your American father after an unhappy marriage — leaving a country that you identify as a chaotic environment where you were always getting into fights and in trouble for a country that you identify as a secure and orderly environment, and yet being inevitably interested in the country that you left behind in a way that’s different from being interested in an entirely foreign country, and being able to access an outsider’s perspective on the country that you’ve joined in a way that only someone who is conscious of having joined it can do. On the “He ain’t heavy, he’s my brother” thing. I loved that, because it’s such a 2000 AD note — throwing in a stupid joke exactly when you’re not expecting it. That sense of not caring one little bit about tonal coherence, and daring the reader to object. One thing I’ll note is that while the spirit of 2000 AD in this period might be punk, it’s not written *for* that audience — it’s written for 10-year old boys whose parents are probably not going to let them play “White Riot” at high volume, and certainly aren’t old enough to go out to hear it live. The references are often based on the sort of universal cultural property that pretty much everyone can recognize, and for a child, that’s very often your parents’ music. Even from the ‘80s, I can remember a bit in 2000 AD that was based on the Rolling Stones. It’s interesting how Dredd develops its own memory of itself, and what it chooses to remember and what it doesn’t. 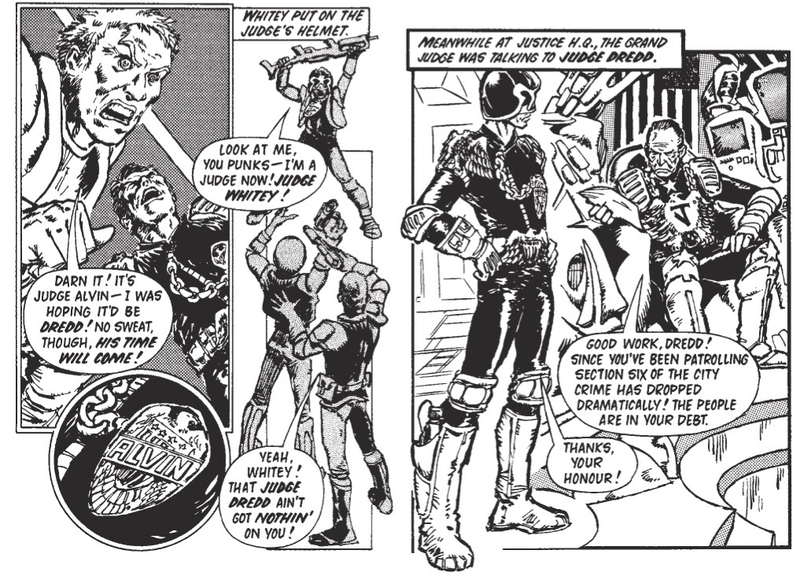 There were certain elements of these late-70s stories that ‘80s Dredd consistently remembered as having happened. I knew that the Robot Wars had happened, that there had been a Cursed Earth saga, that there had been a Judge Cal. But at least in my memory, the long Luna-City 1 sojourn was completely edited out — there was no hint that anything like that had ever happened. I just wanted to point out that this was a great comment. 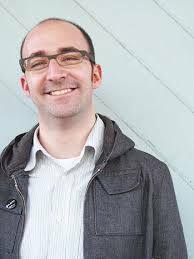 I didn’t know that much about Grant’s background but it makes sense with what he was creating at the time. Thanks for the nice words. After writing the above, I became curious and looked into Pat Mills’s schooldays — and, whoa, is there stuff there! I second the praise for this comment. Great, great stuff that clarifies things for this American reader. Quick disclaimer: I’m not actually British. I’m from Ireland, and have lived in the US for quite a while now, since the 90s. That means I’ve spent a lot of time in Britain, have British relatives, grew up exposed to British culture — or more accurately British media, which is to say London media to a very significant extent. But Britain is a very big, complicated, place and I’m still speaking as an outsider. Just one who had a closer vantage point than some from which to observe. This was an especially brilliant comment/set of observations, Voord, and I wish I’d been half as incisive on the podcast. Thank you!! For those of us hoping to follow along, where can we pick these up? With Baxter Building, I just used Marvel unlimited, but less sure where to easily access 2000AD content. Please keep in mind this is one of the few cases where being available for the Kindle does *not* mean they’re available as well in Comixology. It’s native-Kindle stuff and best viewed with a very good tablet. 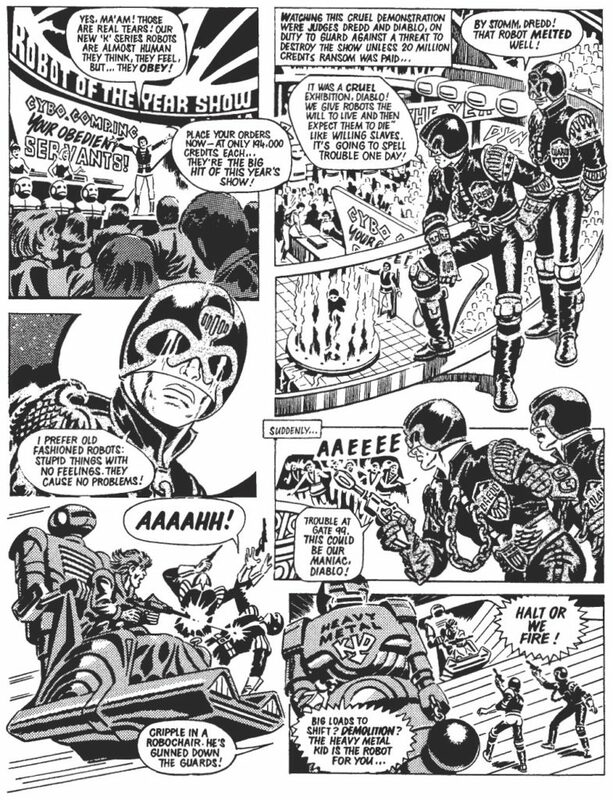 2000ad did actually miss a few weeks of publishing over the course of it’s 40 years. I wouldn’t say that Mills created Dredd (He actually wouldn’t say that himself either). Mills definitely helped shape dredds world. He did give the Judges an ‘origin’ story as well as give Dredd a more human face with his ‘better’ brother Rico. I would say…Wagner and Ezquerra were Dredd’s ‘Parents’ while Mills was the ‘Midwife’. What’s interesting is…US comic books started out as ‘anthology’ titles that slowly disappeared to feature one main story/character…while UK comics kept the anthology format. Love the podcast btw. Might also be worth checking out for you guys is…. My favorite thing about the first strip, “Judge Whitey,” is that you get this great powerful shot of a judge on his motorbike right next to the logo and you think ‘oh, obviously this is Judge Dredd…’ and than the guy get unceremoniously killed. Great episode! I liked how you got us to read the 340 pages then said it’s not the best jumping on point! In fact I had read the early 2000ADs when they came out as a kid. 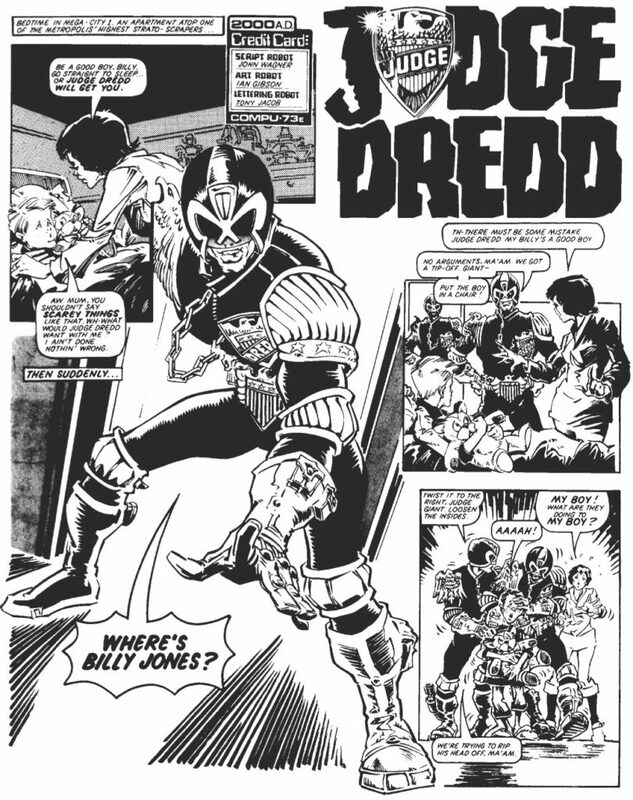 Dredd was not the standout story for me- this was Flesh! Cowboys farming dinosaurs for a future food crisis, and getting eaten by them- Dredd was tame by comparison to a 9 year old boy. 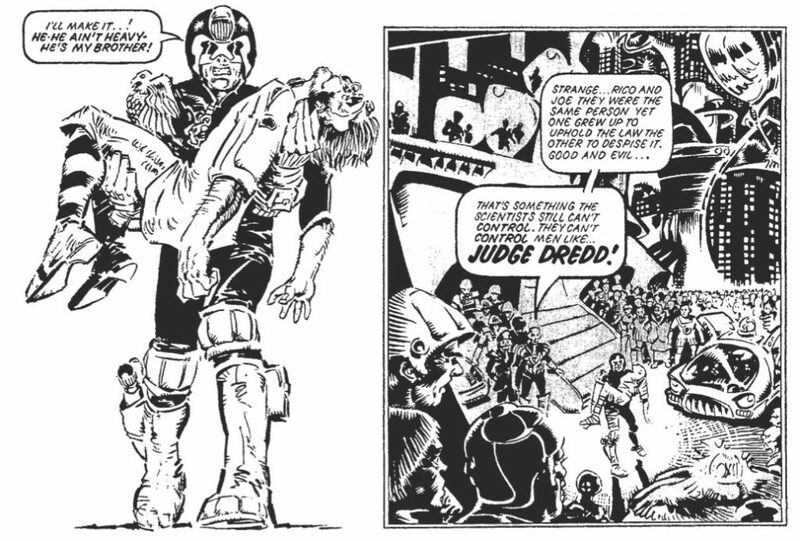 I have always felt as Jeff said that Dredd is the stability at the centre of Mega City 1 craziness and while I admire the character design I do find him a little, shall we say, one-note, but I do realise that’s the point. Reading through the case files will help get on top of the surrounding chaotic continuity. Nice to see Ron Turner getting some love. I really liked the Rick Random: Space Detective collection which came out about 10 years ago and is probably the easiest way to get a chunk of his work easily-ie on Amazon. If you like the thought of stylish people smoking in space, surrounded by sleek and imaginatively designed machinery, this may be the book for you. Of course, these are stories from the 50s and 60s so, unlike Dredd, when the space-faring protagonists decide to commit planetary genocide on a population with a technological level of medieval Europe because they’re standing in the way of ‘progress’, there’s no irony. These are more reprints which have been coloured by John Ridgeway. It’s one of the most successful examples I’ve seen of comics drawn for black and white having colour added. For those who’ve never seen it: Future Shock! : The Story of 2000AD is available on Amazon Prime as well. A nice companion to Drokk! Outstanding podcast guys! Gibson’s art does look busy in the casebook format, let alone on a tablet, as will Ron Smith’s I think, but this is a problem with the reduced page size. 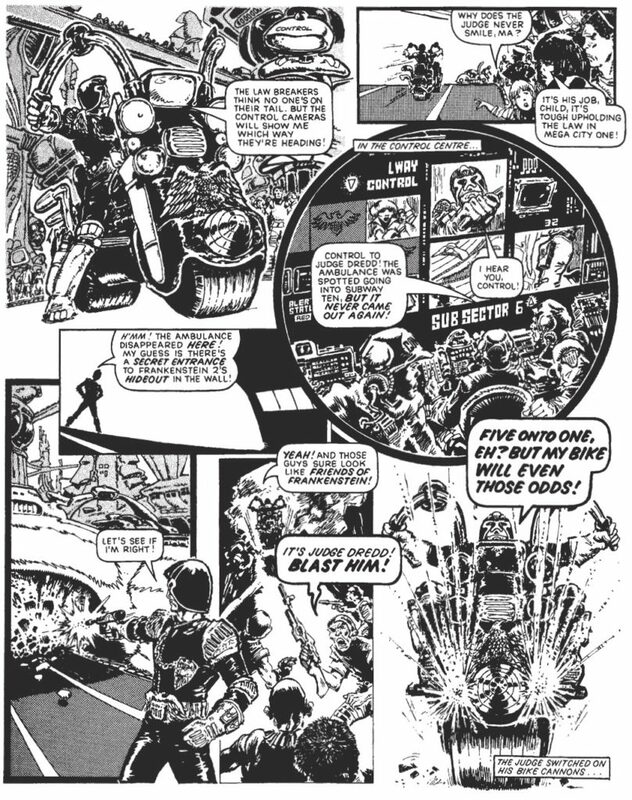 On the larger pages on which it was orignally published, that early Gibson busy-ness is the perfect representation of the frenetic chaos of Mega City One. Just as the colours of older American comics look deliriously super saturated when they are reproduced on newer glossy white paper, the art suffers by being moved into a physical medium other than the one it was designed for. Also, a take on “He aint heavy, he’s my brother” ….. what if it’s not a joke at all ? As a ten year old who’d never heard the song, I just found the line heartbreaking.